« Who Is Running The Show? Raise your hand if you think the Bucs are going to play some patsy game of wait-and-see with the most important position the roster. That’s right. Put your hand in the air if you believe 2014 is the year the Bucs experiment to see whether 35-year-old Josh McCown plays his first good full season or whether Mike Glennon can pull an offense out of the NFL cellar — without another viable option on the roster. Joe’s hand is not raised. In fact, Joe would be stunned if the Bucs don’t draft a QB they believe has “franchise” potential this week. Why wait? 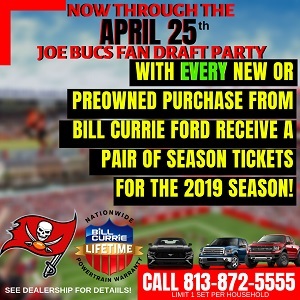 If the decision belongs to general manager Jason Licht, then Joe’s sure the Bucs will move quickly. In this Buccaneers.com video (you can actually see Joe chatting with Licht in it), Licht states his experience as a personnel executive with the Eagles, Patriots and Cardinals taught him not to hesitate. “The common thread I could see with those successful teams was just making swift decisions and not looking the rearview mirror,” Licht said. Yes, Joe expects a swift and stunning blow will be dealt to the hopes and dreams of the Mike Glennon Mob. IF we go QB in the first it will be Carr and not Manziel. Look for the Bucs to draft a QB in round 2,3 or 4 ( if Carr is there in Round 2 it’s hard to see Lovie/Tedford not pulling the trigger…if not, look for someone like Murray, Savage, etc..in round 3-4). In round 1 I’d love to see Mack drop to us (probably won’t happen) but we will either get Evans, a top O-lineman or trade down for more picks and take the BPA (Ebron, Donald, Barr, etc…). Trading down (if we find the right partner) might be the best way to go considering we have so many holes to fill on Oline and WR! Thank God “24” is back on tonight so I can take a break from this dang delay in the draft! The wait is driving me crazy! At least we get to watch Jack Bauer kill some bad guys tonight! Hope they do what is best for the long haul – draft a QB. At best, a 7-9 or 8-8 record is realistic for this season which would put the Bucs out of the running for a top QB in next year’s draft. Glennon is fine for a back up but can not complete the long passes & is not mobile. His lack of mobility and the play calling exposed the weakness of the O-line. The must have a QB that can extend a few plays per game with his legs. Pick anthony barr if watkins is gone lol move david to mlb he has the wits n everything to be our core backer. Push kuechly outta that top dog lb n take the respect he deserves. Just watched the press conference from last week with Coach Smith and GM Licht. 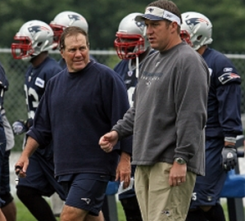 Licht CLEARLY says his first time in the draft war room was 2001 while with the Patriots. Someone keeps telling lies that this is his first time in a war room. Your name rhymes with Buns Eye. Go view the video on the team website if you don’t believe me. Also view his resume, he started in the NFL in 1996. If JFF is there then we pull the trigger. Sammy @ 7…..or Mack if we are lucky….or trade down. Plenty of great players left in the first round and lots of needs. I’m with you on 24….will have to postpone my 3rd viewing of Deadwood reruns…..
Mock if you like (excuse the pun) but he is probably right. Logan Thomas at quarterback and Coleman at wide receiver, pick whomever else you want with the rest. Blacklist is pretty good…but it ain’t 24! The Bucs will not draft Carr if Manziel is available. I love knowing it all too. And with the 7 pick overall the Tampa Bay Buccaneers pick…………..a football player. Think the Bucs would like Manziel but are fine with sitting put or trading back to grab Carr. I’m really not that much of a TV watcher…mainly sports and movies…but this week is full…Game of Thrones last night, 24 tonight, Deadliest Catch Tuesday and then the Draft later in the week. I’m going to feel like a total couch potato this week! Agree with you totally on draft strategy! Would love for Watkins or Mack to fall to us…just don’t think it will happen. Trading back and getting Ebron or Lewan or Barr AND an extra pick or two may be the best bet! With all the Juniors coming out this year, this is a very deep draft! Can’t get here soon enough as far as I’m concerned! Alright, its def time to change your site name….the constant whining about Glennon and those who support him, and the daily vitriol of the kid is beyond annoying. I know you hate that you were wrong about Freeman, and you’re feeling defeated because we’re probably not getting JF, but your constant attacks on Glennon and anyone who supports him is getting mental at this point. If he stays, are you going to find a new team? Dang Netflix pulled 24 while I was trying to marathon my way through it. Sadly I won’t be watching the new episodes since a show like that deserves to be seen in it’s entirety. Back to football. Whomever we choose, I don’t think it will be in the first round. Our franchise qb will wear a headset his first year. Don’t need a qb at #7 with pressure to play him immediately. I just hope we pass on JF in the 2nd and 3rd rounds when we finally address the position. I for one enjoy this site. We all are entitled to our opinions in blogging but attacking the Joe Bucs Fan personnel and their opinions is a little Bush league don’t you think? If you know so much and are so unsatisfied then why not create your own site? Just saying. SMH. Imo we need a 1st round QB regardless of if it is with the 7th pick or not. I trust the Bucs staff know who they want and will get the right guy for the new system. Bring on the draft already! !! I never was much of a Glennon fan but I still wouldn’t give up on the guy already especially when I look at this years QB class. I think it would be a huge mistake to waste a #7 pick on any of the QB’s in this year’s draft (unless Manziel falls to 7 which I doubt). I went back and looked at a few of Glennon’s college tapes this past weekend compared to Manziel, Bortles, Carr and Bridgewater and out of all of those guys Manziel was the only one that I thought was somewhat intriguing. Glennon can make all of the throws that any of the QB’s in this draft can make and he has a proven work ethic. The only thing he’s missing is mobility. Personally, I would love to see the staff backtrack on their comment of only keeping 2 QBs on the “roster”. I’m hoping that is the active roster, not the total roster. I wouldn’t mind Glennon being kept as a backup to McCown AND drafting a rookie in the 1st round with pick #7 and having him sit the bench. The trade deadline was moved back last year, so we have more time to decide if we want to keep Glennon as a backup in future years to the rookie draft pick that should start next year and McCown (if all goes well) could either be traded (or Glennon traded) or backup the rookie next year. Personally, if McCown has a good year, I’d rather trade him and keep Glennon as the backup. We have NO Offensive line !!!!!!!!!!!!!!!!!!!!!!!!!!!!!!!!!!!!!!!!!!!!!!!!!!!!! That don’t matter a franchise QB can make OLineman play better. Haven’t you been reading all these posts? Lol I’m with you on needing more help on our Oline. I still can’t see backing McCown with a rookie. Blacklist is a great show. James Spader makes that show.